Private Applicator — A licensed applicator who uses any restricted use pesticide (RUP) for purposes of producing any agricultural commodity on property owned or rented by him/her or his/her employer, or to apply on the property of another person without compensation (other than trading of personal services between producers of agricultural commodities). Private Pesticide Safety Education Program (PSEP) sessions — View the Private PSEP schedule of dates for certification/recertification training (sort by clicking on county, date, time, etc., on the black bar at the top of the schedule). Testing — To inquire about taking a private applicator exam, administered by the Nebraska Department of Agriculture (NDA), contact NDA at 402-471-2351 or 800-831-0550 (toll-free). Private Record Keeping Form (PDF 61 KB) — This form can be printed and used by private applicators to keep records of RUP and GUP applications. My current pesticide license status — Check to see if you are listed in the applicator database operated by NDA, or contact NDA at 402-471-2351 or 800-831-0550 (toll-free). 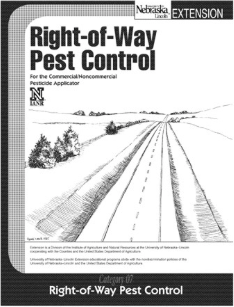 Search for registered pesticides in Nebraska — NDA database of pesticides registered for use in Nebraska. Commercial Applicator — A licensed applicator who uses any restricted use pesticide (RUP) on a contractual or “for hire” basis. Commercial applicator shall also include any person using restricted or general use pesticides “for hire” or compensation for lawn care, structural pest control, or community-wide outdoor vector control. Noncommercial Applicator — A licensed applicator who applies RUPs only on lands owned or controlled by his/her employer or for a governmental agency or subdivision of the state. Also, a licensed applicator who applies either general or restricted use pesticides to control mosquitoes on behalf of a political subdivision of the state. Initial training sessions — For those wishing to get their license for the first time. Offered from February through April in various cities throughout the state. These sessions are intended to be a review of key points from the study materials (see below), not intensive instruction. Recertification training sessions — For those whose license expires on April 15. Offered for most categories in February and March in various cities throughout the state. If you need to recertify in a category that no recertification sessions are available for (or if you miss the sessions or your license has already expired), you will need to take the General Standards exam and category exam(s) (See options 3 and 4). Purchase Study Materials — This Marketplace allows you to order PSEP study materials online with a credit card. We recommend purchasing the General Standards (00) manual, plus any category manual(s) you will need. The PDF manuals are digital files, and are intended to be viewed on your screen. Printing of these files will use copious amounts of ink and paper, and is not recommended. Order the manuals without PDF to receive physical copies by mail. My current pesticide license status — Check to see if you are listed in the applicator database operated by the Nebraska Department of Agriculture (NDA), or contact NDA at 402-471-2351 or 800-831-0550 (toll-free). 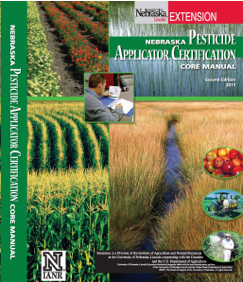 The chemigation certification program is administered by the Nebraska Department of Environmental Quality (NDEQ), and can be found on this UNL Water page. EPA has extended the registrations for three RUP dicamba products (XtendiMax®, Engenia®, FeXapan™) until December 20, 2020. Please visit our Dicamba Label-Required Training page for additional information on using these products in 2019. NOTE: A certificate of completion is not required by NDA or EPA to confirm dicamba training. NDA's list of dicamba-certified applicators is regularly updated online and is the only way to confirm an applicator has received dicamba training. Applicators need to be aware that a Certified Applicator Training requirement will begin appearing on paraquat product labels in the near future. Once this requirement appears on the label, licensed applicators will be required to pass a paraquat-specific training program in order to purchase or use (mix, load, apply, etc.) the product. An EPA-approved paraquat training program is now available. New closed-system packaging designed to prevent transfer or removal of the paraquat product except directly into proper application equipment. Changes to the pesticide label and distribution of supplemental warning materials to highlight the toxicity and risks associated with paraquat products. Restricting the use of paraquat to certified pesticide applicators only. Individuals working under the supervision of a certified applicator are prohibited from using paraquat. Persons who live outside of Nebraska may obtain a license from NDA if they hold valid credentials from a state, agency, or tribe that NDA has a reciprocal agreement with. EPA certifies Private and Commercial applicators to legally apply restricted use pesticides in Indian Country.